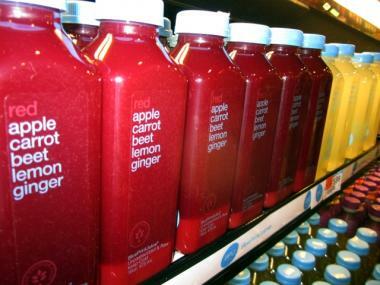 The BluePrintCleanse juices have been popular at the Whole Foods in TriBeCa. LOWER MANHATTAN — Fans of BluePrintCleanse juices soon won't have to travel all the way to the TriBeCa Whole Foods to get their fix. After the nutrient-rich juices proved so popular in TriBeCa that workers had trouble keeping them in stock, BluePrintCleanse is expanding to the rest of the city's Whole Foods locations. "It definitely exceeded our expectations," Zoe Sakoutis, founder of BluePrintCleanse, said of the success in TriBeCa. Until the beginning of this year, the raw juices that manufactures claim offer a body cleanse were only available in bulk online. Shortly after they debuted at the TriBeCa Whole Foods, they made the dairy department — where they're stocked — the top selling in the country, Sakoutis said. The TriBeCa Whole Foods carries four varieties of BluePrintCleanse juices. "They seem to just fly off the shelves," said Sakoutis, who is a certified nutritional consultant. A Whole Foods spokesman said he could not confirm sales figures but said the juices have been "popular" in TriBeCa. 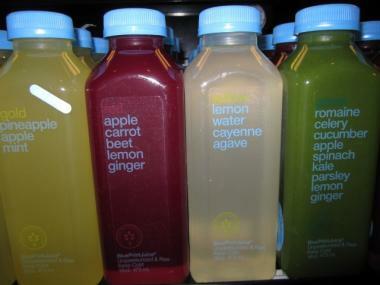 As part of the expansion, BluePrintCleanse juices recently went on sale at the Bowery Whole Foods, Sakoutis said. Union Square and Columbus Circle will get the juices in mid-May, followed by Chelsea and the Upper West Side in late June. "I'm glad they're expanding," said Odine Bonthrone, 45, a TriBeCa resident who was picking up a BluePrintCleanse spicy lemonade with cayenne pepper recently because she felt under the weather. Bonthrone said she often stops by Whole Foods to grab a green BluePrintCleanse juice in the morning, and she hopes the brand's growth will enable them to keep up with the local demand.